If you watch any big flock of snow geese on the ground you will see nothing but hopping and flapping snow geese. They are a greedy bird that seems to have a solid case of ADHD. They can never sit still. 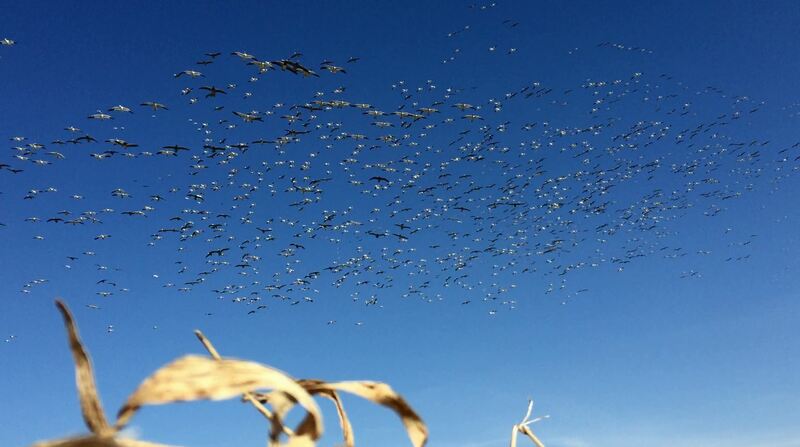 As a snow goose hunter you want your spread to mimic this movement. Not only can you use this movement to attract more birds, you can use it to your advantage on getting the birds to setup within shotgun range. 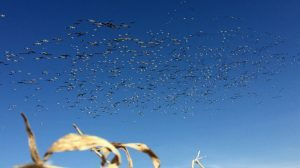 In the information below I will go over the two types of motion decoys I find to be effective on snow geese and how they can help you kill more birds. The fundamental motion decoy I believe every snow goose hunter should have ( 2 or 3 is better) is a rotary machine snow goose decoy. From high above they create a circular movement that snow geese are attracted to, especially on migration days. When these first hit the market years ago one rotary machine worked well, but as they have become more popular I have increased the number I run to three as I always want to be on the leading edge of tools to hunt these heavily pressured birds. Beyond three seems to be diminishing returns. I also prefer a 2 arm over a 4 arm because from up above you can see the bird separation better. A decoy I started running last year and was impressed with was the Power Flapper Decoys. They are a motorized snow goose flapper decoy. The price is very reasonable and the motion is very unique. Last year we ran three of them to test and the results were good. The decoy can be set to run constant or to run on an internittent mode. This year I plan to run 6-10 of them spread evenly throughout the spread on the intermittent setting. This will provide a flapping motion that turns on and off in diffrent areas of the spread. As the geese circle multiple times coming in from the stratosphere, they will see diffrent areas of the spread coming flicker with a decoy that looks like a bird flying a few feet to get to a better feeding area. Watch the video below for a look at these in the field. Very few hunters are running these yet which is one of the reasons I will be running more this year. Different is always good when it comes to motion decoys! Should I buy more decoys or a rotary machine? For running traffic in the Spring I would say get to 500+ decoys before buying a rotary machine or Power Flapper. A bigger spread simply kills more geese day in and day out. Do I need to buy extra flyers to put around my Rotary Machine? I personally prefer 2-4 additional flyers around each rotary machine. It makes it look more like a flock. Should I buy another rotary machine or add Power Flappers? If would get 2-3 Rotary machines and then start adding Power Flappers. The long range drawing power of Rotary machines is hard to beat. Making you a better snow goose hunter!